The sitter's daughter, Charlotte Dexter [1812-1878], Montgomery, Alabama; her brother, Andrew Alfred Dexter [1809-1853], Montgomery, Alabama, or his widow, Sarah Williams Dexter [1815-1890], Palestine, Texas; their granddaughter, Charlotte Morton Campbell Longino Howell [b. 1875], New Orleans, and Galveston, Texas; sold 1920 to (M. Knoedler & Co., New York); sold 31 May 1921 to Thomas B. Clarke [1848-1931], New York; his estate; sold as part of the Clarke collection on 29 January 1936, through (M. Knoedler & Co., New York), to The A. W. Mellon Educational and Charitable Trust, Pittsburgh; gift 1947 to NGA. This provenance was supplied by Mrs. Howell to Knoedler in a statement dated 7 May 1920 (NGA curatorial file). 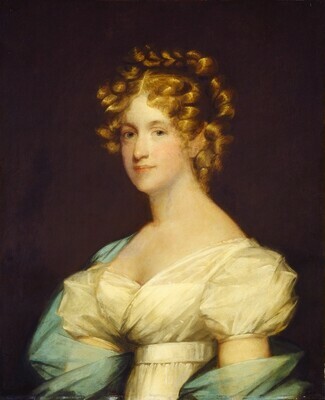 Mrs. Howell's personal life was a source of confusion for later researchers, who did not realize that the sitter's namesake in each generation was the owner of the portrait. Mrs. Howell, the daughter of Charlotte Morton Dexter Campbell (Mrs. Joseph Campbell, 1848 1924) of Mobile, Alabama, first married Dr. Thomas Chandler Longino of Galveston (d. 1911). She then married Dr. Park Howell, but she divorced him shortly after she sold the portrait. (An unidentified label attached to the reverse of the painting incorrectly gives the owner as Dr. Park Howell.) Her third husband was John H. Means of San Antonio, Texas; letter of 12 November 1952 and other correspondence (NGA curatorial file). Information on the family is found in Orrando Perry Dexter, Dexter Genealogy, 1642-1904, New York, 1904, 122-128, 184-185, 231-232. The name of the seller and the date of purchase are recorded in a copy of Portraits by Early American Painters of the Seventeenth, Eighteenth and Nineteenth Centuries Collected by Thomas B. Clarke, Exh. cat., Philadelphia Museum of Art, 1928, annotated with information from files of M. Knoedler & Co., NY (copy in NGA curatorial records and in NGA library). Portraits Painted in the United States by Early American Artists, The Union League Club, New York, February 1922, no. 20. Portraits by Early American Artists of the Seventeenth, Eighteenth and Nineteenth Centuries, Collected by Thomas B. Clarke, Philadelphia Museum of Art, 1928-1931, unnumbered and unpaginated catalogue, as Mrs. Andrew Dexter by Gilbert Stuart. Mason, George C. The Life and Works of Gilbert Stuart. New York, 1879: 174. Bowen, Clarence. The History of Woodstock, Connecticut. 2 vols. Norwood, MA:1:189, 191, repro. Barker, Virgil. "Portraiture in America Before 1876." The Arts 13, no. 5 (May 1928): 276-277. Swan, Mabel M. "Paging Gilbert Stuart in Boston." Antiques 34 (December 1938): 308-309. American Paintings and Sculpture: An Illustrated Catalogue. National Gallery of Art, Washington, 1970: 108, repro., as Mrs. Andrew Dexter (?) by Gilbert Stuart (?) and Unknown Artist. Whitehill, Walter Muir. "Perez Morton's Daughter Revisits Boston in 1825." Proceedings of the Massachusetts Historical Society 82 (1970): 21-47. American Paintings: An Illustrated Catalogue. National Gallery of Art, Washington, 1980: 239, repro., as Mrs. Andrew Dexter (?) by Gilbert Stuart (?) and Unknown Artist. Miles, Ellen G. American Paintings of the Eighteenth Century. The Collections of the National Gallery of Art Systematic Catalogue. Washington, D.C., 1995: 279-280, repro. 281.